Jewish Lights Publishing, 9781580233101, 123pp. A fresh look at Jewish folktales--wise, witty, hilarious. 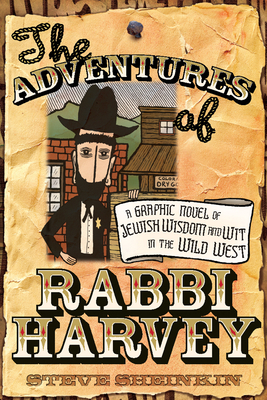 After finishing school in New York, Rabbi Harvey traveled west in search of adventure and, hopefully, work as a rabbi. His journey took him to Elk Spring, Colorado, a small town in the Rocky Mountains. When he managed to outwit the ruthless gang that had been ruling Elk Spring, the people invited Harvey to stay on as the town's rabbi. In Harvey's adventures in Elk Spring, he settles disputes, tricks criminals into confessing, and offers unsolicited bits of Talmudic insight and Hasidic wisdom. Each story presents Harvey with a unique challenge--from convincing a child that he is not actually a chicken, to retrieving stolen money from a sweet-faced bubbe gone bad. Like any good collection of Jewish folktales, these stories contain layers of humor and timeless wisdom that will entertain, teach and, especially, make you laugh.